Okay, so to keep up with the “Canadian” theme that this blog seems to have taken, I will profile all of the remaining Canadian teams left in the 2012 NHL post-season. Oh, and there are none left. Pathetic. Out of 30 NHL teams there are 7 Canadian teams in today’s NHL. Yet every single one of these 7 teams failed to qualify for the second of the playoffs this year. So instead of profiling the remaining Canadian teams, I will profile the teams that did not make the playoffs and what I think should be done to alter their lineups to boost them into the post-season. I’ll start my overview with the Calgary Flames. 8 years removed from their Stanley Cup Finals appearance in 2004, the Flames don’t have very much gas left in the tank. Finishing with 90 points, good for 9th place in the Western Conference, the Flames were not too far removed from the playoffs. However, their go to players are aging superstars Jarome Iginla and Miikka Kiprusoff, both of whom are on the wrong side of 33. With no immediate scoring help in the system other than Swiss sniper Sven Bartschi, the Flames need to make a move a la Philadelphia and restock the cupboard. The Flyers traded franchise cornerstones Jeff Carter and Mike Richards away last summer and got a lot in return, including Jakub Voracek, a first round-pick that Sean Couturier, Brayden Schenn and Wayne Simmonds. All of those players mentioned are young players who contribute for a long time to come. The Calgary Flames need to make a move like this. 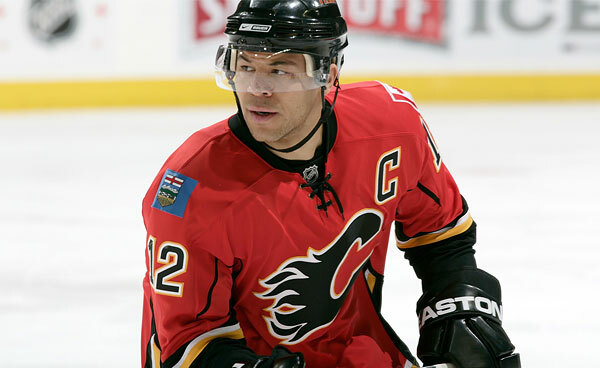 Captain Jarome Iginla is still a 30 goalscorer. Although in the twilight of his career, he could still prove useful to a contender looking for a scorer. Teams like Detroit or San Jose could be interested in upgrading up front; and Calgary would obtain several young players. Jay Bouwmeester and his albatross of a contract could also be a problem. If shed, they Flames could potentially make a splash in the free-agency market, going after big names like Ryan Suter or Dennis Wideman. Both of these players could potentially help the problem of how many shots per game Calgary faces, allowing 30.8 per game like they did in the 2011-2012 is do not make Kiprusoff’s job any easier. ‘Kipur’ has also been a workhorse for too long, playing 70+ games 7 seasons in a row and counting. The Flames need to find a good backup to complement Kipirsoff’s huge skill. If they can rest their starter, then he will play a better game in the long run. The Flames also need to find a great #1 centre. Despite his chemistry with Iginla, Olli Jokinen does not cut it as a #1 centre in the NHL. Matt Stajan’s talents could be better served on the 3rd line. These are a few of the problems that General Manager Jay Feaster the Flames could easily address this summer, especially with Iginla to use as trade bait. But if Calgary does not take time to fix these problems, the Flames’ playoff hopes with die with their stars’ retirement. Look for my next post with an overview of the Edmonton Oilers and what they have to do to make the playoffs next year. This entry was posted in Uncategorized and tagged 2012, 2013, 9th, bartschi, brayden, calgary, carter, couturier, dennis, detroit, do, eliminated, feaster, flames, hockey, iginla, jakub, jarome, jay, jeff, jokinen, jose, kiprusoff, make, matt, miikka, mike, need, NHL, olli, overview, philadelphia, place, playoffs, red wings, richards, Ryan, san, schenn, sean, sharks, simmonds, stajan, suter, sven, the, to, trade, voracek, wayne, what, wideman, workhorse, young. Bookmark the permalink.